I had never imagined that. 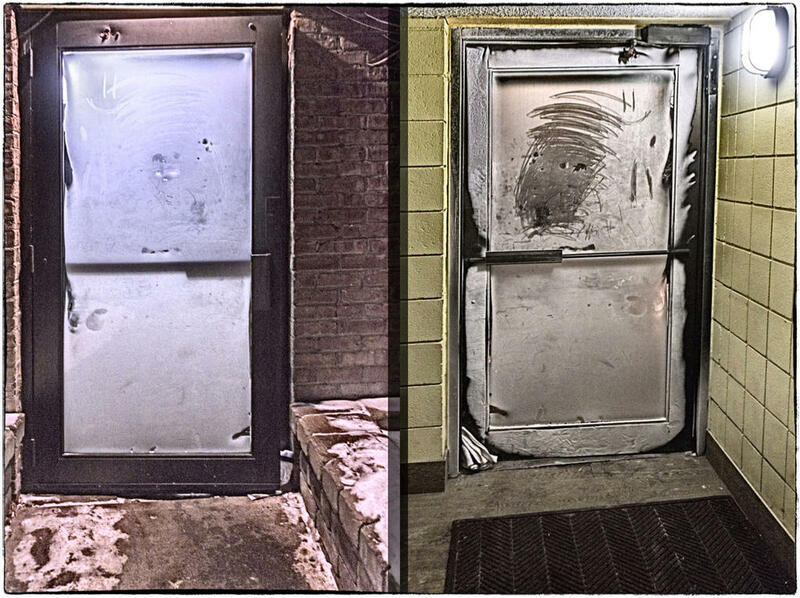 In all the snow storms I havecexperienc d from Boston, Massachusetts to Rochester, New York, I haven't seen a frozen door! It must be some defect that allowed water to get into the locking mechanism and/hinges. I guess this can happen if the heat in the building is allowed to turn off! The door is not perfectly closed because a paper (newspaper ?) in inserted to prevent so. It looks like the door is made of 2 different materials. One inside and another outside. It is an interesting perspective of an aperture... I never thought of this before. The hotel was far from abandoned, Antonio, but packed with guests. The management handled the heating problem effectively, such that nobody shivered inside their rooms. You're right that the door was only partly closed, with a towel used to prevent closure. This was presumably so that the door would not freeze shut. However, the appearance of different interior and exterior materials is misleading, with the white interior due entirely to frost. i'm glad you appreciated the perspective. I hadn't thought it out until it so forcibly appeared before me.